It can be really frustrating when you come home from a longs day work to find out that your Cat has decided to pee outside the litter box. I understand the feeling and the annoyance this can bring to a Cat parent. Not only has your Cat not used the litter box that is provided for him but now the whole house smells of Cat urine. And, let’s face it, Cat urine odor is not the best of odor you would want your house to smell like. On top of all this, Cat urine can stain fabrics. If your cat is not using his litter box then this is something you need to look into and find out why this sudden change has happened. I stress that you should not punish your Cat nor scold him as this can have a very negative impact on your Cat and elimnating this behavior. Most Cats are not fond of sharing the litter box with one another. If you have multiple Cats then you should provide a litter box for each one of them. Most Cats want their privacy when they want to relieve themselves. 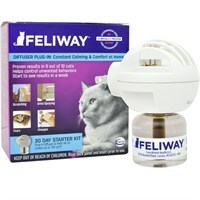 You should not look at what is convenient for you but look at what is the best for your adorable feline friend. The location choice should be convenient for your Cat and safe also. Avoid putting the litter box where your Cat eats and drinks. The litter box should also not be placed somewhere in the house where they may get scared for example a Washing Machine. If it is a multi-cat household then it shouldn’t be lined up in one room rather have them scattered around the house. The last thing you want is that your Cat is avoiding the litter box because he is afraid to cross the path of another Cat just to get into the one room where they are all located. Basically, place each box to the Cat’s preference. Be generous when filling up the litter box with litter. Keep a good amount of litter in the box and try to keep it consistent. 3 inches of litter is a good amount. Cats are very clean animals so they would expect their litter box to be cleaned too. If it is dirty then they will look for other alternatives to relieve themselves. Ask yourself, Would you want to use a toilet that is not flushed or completely dirty? Of course not! So then why would your Cat? You should scoop the litter box at least twice a day. Wash the litter box every month that way it is regularly cleaned and fresh for your Cat to use. 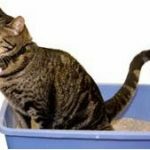 When choosing a litter box, rather choosing one based on the convenience on where it is going to be located in the house, it is better to choose one based on the size of your Cat. In general it should be 1 and half times the size of your Cat. Well, first and foremost it’s important that the points mentioned above, you have taken action for example cleaning out the litter box and using the appropriate litter. This could be enough to get your cat to start using the litter box. However, if you do see your Cat using an area in the house he is not supposed to then you should pick him up immediately and place him in the litter box. It’s important to let him know how good he is especially if he has used the litter box. Make a big deal out of it. This way, you are creating a positive experience. I strongly advise you not to shout or scold at your Cat under any circumstance if he has urinated in the wrong area. 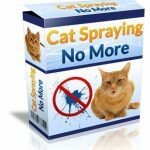 This is because it will create a negative association in your Cats mind with the litter box which will only result in making it harder to get your Cat to use the litter box. In these situation we need to understand our Cat and help them. Another way you can comfort your feline friend is using Feliway as this creates a calming effects on Cats in stressful environments and helps to de-stress your Cat. Most Cats will start using the litter box fairly quickly when you start creating a positive association using the litter box. 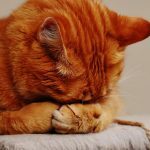 If your Cat used to use the litter box and has suddenly stopped then this could be a medical problem so you should schedule a visit to your veterinary as soon as possible. It can be frustrating when your Cat is not using the litter box. I understand that as I have a Cat of my own and when he does not use the litter box it makes me want to tear my hair out! It can take months to actually figure out how to stop this behavior! What if there was a quicker way? In this guide you’ll learn everything about Cats and not using the litter box! Oh, and it has a 60 day money back guarantee. So it’s a win win situation! Cat Language Bible Review – Who Else Wants To Hold a Conversation With Their Cat?